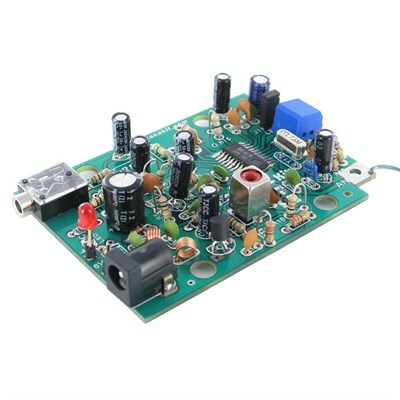 The CK555 or UK555 is a high quality stereo PLL FM transmitter incorporating a Phase-Locked-Loop (PLL) synthetizer. It is based on the Rohm BA1417 PLL FM Transmitter Integrated Circuit and offers a choice of up to 14 preset transmission frequencies spaced every 200 KHz between: 88.7 – 88.9 MHz (Low Band Mode) and 106.7 – 107.9 MHz (High Band Mode). It has outstanding frequency stability thanks to the PLL crystal controlled design and offers excellent high-fidelity audio performance. It is ideal for use in your home or office to transmit MP3 songs or internet radio stations from your computer to any standard FM radio. It can also be connected to any other audio source, such as an iPod, a MP3 Player, Walkman, Discman or XM Satelite Radio receiver. The circuit incorporates a stereo audio input jack as well as a DC adapter jack which makes it quick and easy to setup. Transmission frequency selection is done through a DIP switch. An optional accessory kit (Model No. ACC-555) which includes a custom plastic case, front and back panels as well as a metallic telescopic antenna is also separately available.